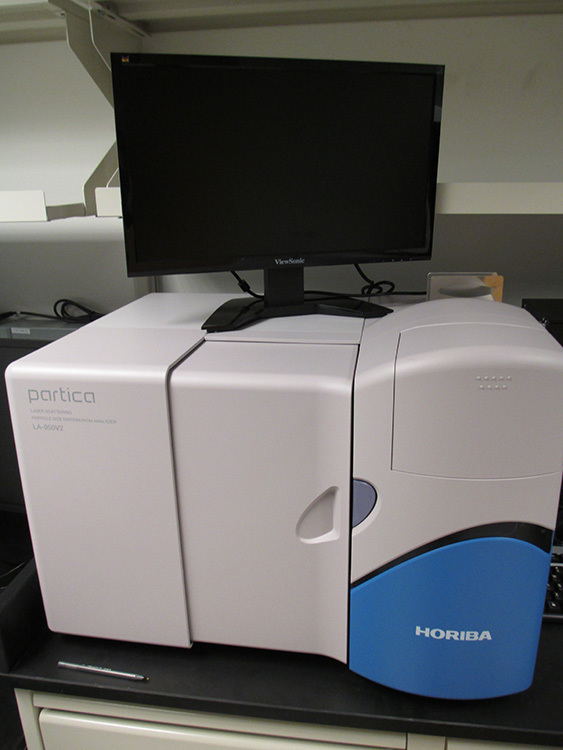 Partica LA-950 Laser Diffraction Particle Size Distribution Analyzer (HORIBA). This instrument uses two laser sources to measure particle size distributions. Where as traditional light scattering is typically limited to colloidal samples a few microns in size or smaller, the LA-950 is capable of measuring particles ranging in size from 10nm to 3mm in real time. The system configuration also features a fraction cell analyzer for characterization using very small sample quantities. Our lab uses this instrument to quantify size distributions of nano- and micro-particles in solution. Heraeus high-speed centrifuges (THERMO). 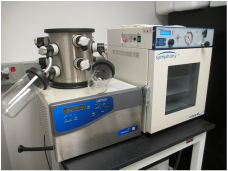 These high-speed refrigerated centrifuges are equipped with quick release rotors, enabling rapid separation of samples under controlled speeds and temperatures. Each instrument can handle 16 microtiter plates, or sample tubes ranging from 1 mL to 50 mL. A unique feature of the X3 centrifuge is the ability to achieve 26,000g using the Fiberlite rotor. Our lab uses this capability to separation particles in the nanometer range without the need for ultracentrifugation. IX-83 fluorescent microscope (OLYMPUS). 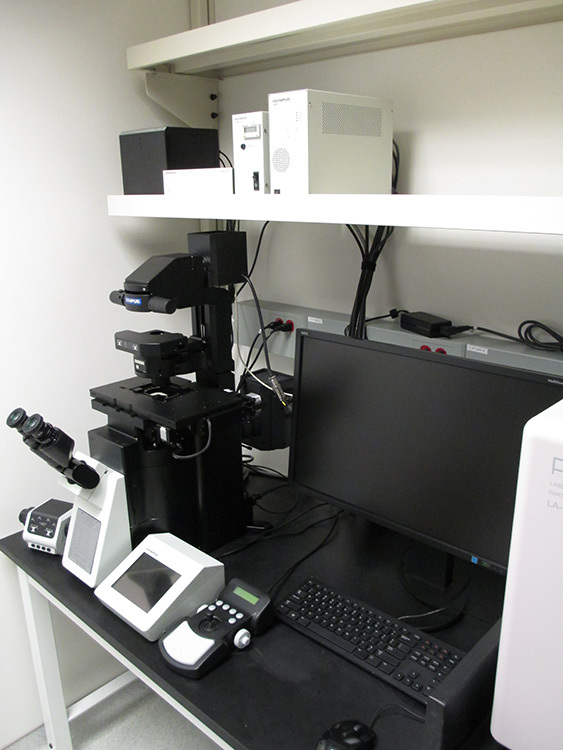 The fully-automated IX-83 microscope allows XYZ scanning image acquisition along 4 channels. The scope also features full hardware integration and a point spread certified 60x oil immersion objective lens. The software package includes the Olympus CellSens 5D advanced image analysis package. Our lab is fully equipped for ABSL-2 certified culture of primary cells and cell lines. 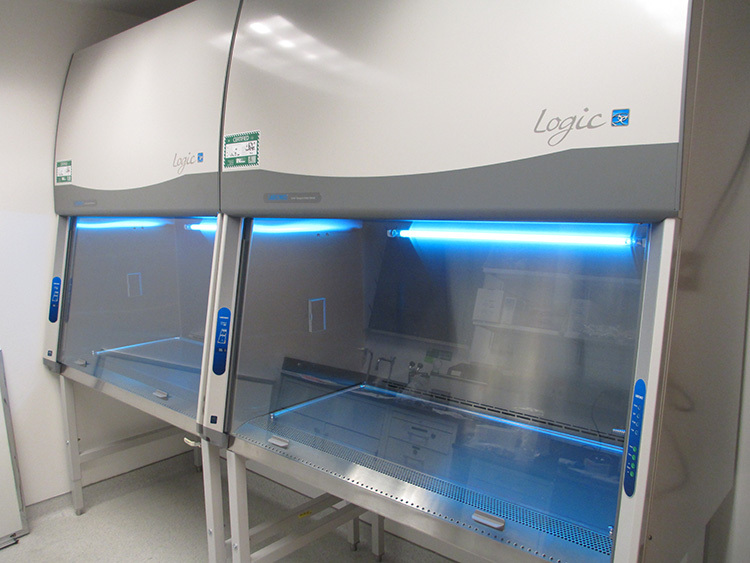 Facilities include two HEPTA-filtered Purifier Logic ii biosafety cabinets (LABCONCO), a jacket-free dual CO2 incubator with built-in a sterilization function, a Primo Vert LED-illuminated inverted microscope (CARL ZEISS) for routine cell counting and observing. Gaertner Scientific Stokes Ellipsometer LSE. This instrument uses a helium neon laser source to measure the thicknesses of soft material films and surface coatings over a range of 0 - 60,000 nm. Thicknesses can be obtained at sub-angstrom precision using a variety of polymeric systems. The lab uses this device to characterize the assembly and stability of surface-delivery vaccines we are currently developing. 405LS Platewasher (BIOTEK). Many of our studies involve analyzing immune signals, metabolites, or other biological molecules produced by cells. This time-saving device simultaneously washes up to 96 wells of a microtiter plate. The system also supports programmable wash cycles. This automation also improves accuracy and reduces errors in a variety of our experimental readouts. FreeZone Lyophilzer (LABCONCO). This instrument uses thermodynamics, condensation, and vacuume to remove moisture from samples while minimizing damage to biological cargo. "Freeze-drying" is important in the vaccine field because this process can make vaccines and other drugs stable under harsh conditions, such as high temperature experiences in developing regions where distribution of vaccines and other medical supplies may occur without regular access to refrigeration. 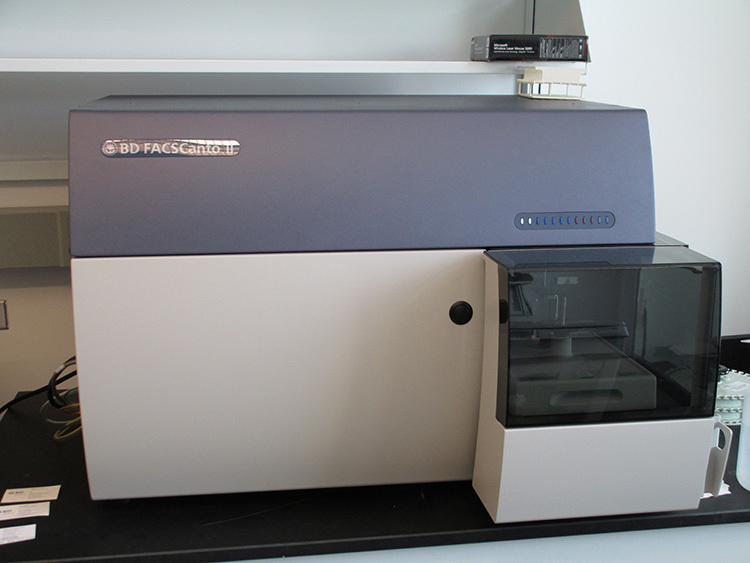 FACS Canto II Cell Analyzer (BD). Equipped with a dual laser bank for 6-color imaging. 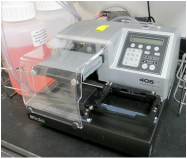 This analyzer also features the BD FACS loader for automated sample acquisition from a carousel or microtiter plates. The lab uses this as a work horse for high throughput flow cytometry assays ranging from cytokine staining to phenotyping.